MarketsWorld, a Reliable and Trustworthy Binary Options Broker. The world of binary options trading is both very exciting and dangerous. There are numerous fraudulent brokers out there, scamming traders every day. Traders and investors must be very cautious when choosing who to invest with. It’s easy to get caught up with the enticing bonuses, offers, and flashy platforms, but it’s really important to delve into all the aspects that make up a broker. Luckily, with our in-depth reviews you can get a good sense of a broker’s reputation and reliability. In the following review, we will be looking at the MarketsWorld binary options broker. Let’s find out if MarketsWorld is a competent and trustworthy broker. We rated the bonus section an astonishing 95/100 since MarketsWorld offers matching style bonuses to its members, as well as a few other types. For the trading software, it rated a mediocre score of 70/100 because of the lack of features and interface of the platform. Customer support earned a very high score due to its 24/7 availability and quality offered. As for the option choice, it scored a very low score due to the lack of choices offered by MarketsWorld. Web-based binary options brokers haven’t been around for very long. Which makes MarketsWorld one of the founding members in the industry, being established in 2011. The company has its headquarters located at Burleigh Manor, Peel Road, Douglas, Isle of Man, IM1 5EP, Great Britain. With the company’s location being in Great Britain, it naturally falls under one of the most transparent financial markets in the world. As well, the broker is licensed and regulated by the Isle of Man Gambling Supervision Commission. With this regulation, MarketsWorld actually does not consider itself a brokerage, but instead is clear about its gaming status. 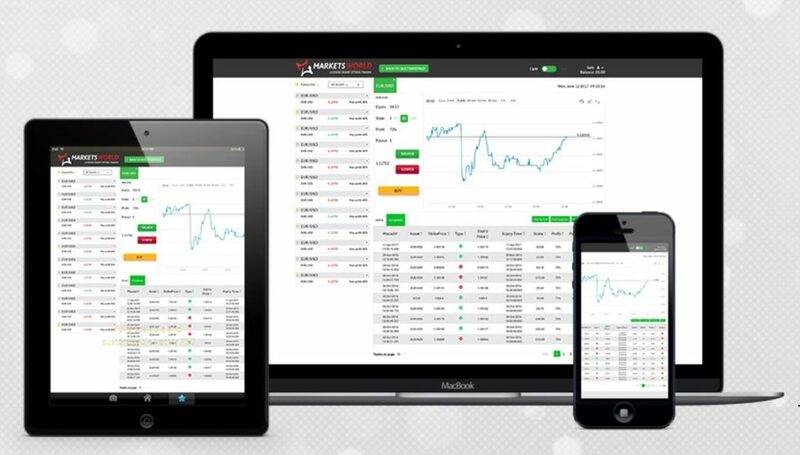 Like many other binary options platforms, MarketsWorld’s platform is web-based. However, what’s different, is that it’s designed and developed specifically by MarketsWorld, making it their own. This comes with some drawbacks though. First of all, the platform is not recognizable to experienced traders who have used some of the industry standard platforms. As well, the platform utilizes different aspects of trading which is unfamiliar to some traders. However, the platform has proven itself to be very fast with no delays when trading. The interface is quite simple, offering only the traditional methods of binary options trading. MarketsWorld’s platform is compatible with all mobile devices through its same web-based platform that is available for desktop computers. The interface adapts to mobile screen sizes and is quite responsive with all the same features. However, many users prefer to use mobile platforms through an app for improved and more dedicated mobile trading features. MarketsWorld only offers their mobile app through Apple’s Mobile App Store, which is disappointing to many Android users. Compared to many binary options brokers, MarketsWorld has a somewhat limited asset class. However, we must remember MarketsWorld does not consider themselves to be a traditional binary options broker, rather as a gaming firm. Market World offer 3 types of asset classes to be traded, including Forex Currency Pairs, Indices Futures, and Commodities. The total amount of assets totals only 18, which is significantly lower than other brokers, and most of these assets are major currency pairs. However, traders do have the same amount of methods as other brokers when it comes to trading styles, such as standard call/put, 60 seconds, ladder options, and 5-minute trades. Members of MarketsWorld do not pay any fees or commissions for opening an account and trading on the platform. In fact, the company is very transparent with their pricing policies and where their fees come in. Traders are not charged with withdrawal fees unless they make more than 1 Bank-Wire transfer per month, the first one is free, then subsequent transfers will have a fee of $53 per withdrawal. As for the payouts, MarketsWorld has been able to offer traders substantially high payouts of up to 95%. This is quite high compared with industry standards of around 85%. MarketsWorld is limited to offering only 1 type of trading account, apart from their live demo account. Again, this is quite different from many other platforms in the industry, but isn’t necessarily a bad thing. Having only one account simplifies things and creates a more transparent trading process with only 1 set of rules, guidelines, and terms and conditions. The account can be opened for as little as $10, and investors can place trades for $1 up to $1000. A cool feature of opening an account with MarketsWorld is the Free Trade. Traders can place $50 on their first trade and take the profits, or if they lose, they will be reimbursed with a $50 bonus. Another interesting first-time bonus, is when a user first deposits money into their account, they will be matched 100% of their deposit, up to $1000. As well, there is a friend referral bonus of up to $500 and a loyalty program offering traders various benefits. 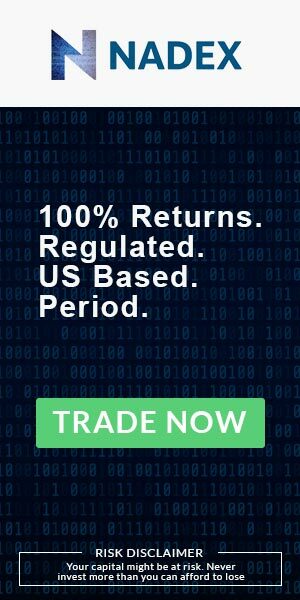 MarketsWorld traders are only required to deposit a minimum of $10 into their account to begin trading. Deposit times are completed almost instantly and can be done via the following methods; Neteller e-Wallet transfers, Bank Debit cards and Visa and Mastercards, including Visa Electron, Visa Debit, Visa Purchase, Mastercard Debit, Maestro, Switch, Solo. Withdrawals can be done with the same methods and are completed within the same working day. In addition to the methods above, traders can also deposit and withdrawal their funds via a Bank-Wire transfer. Traders are aloud 1 free Bank-Wire withdrawal a month, after that the withdrawal fee is $53. MarketsWorld has an excellent customer support team that is available 24/7. They offer an excellent live chat system where they prefer to handle most inquiries, as well they offer telephone support and email service with quick replies from highly qualified staff members. Thanks to the services UK regulation, customer support is of high importance. In addition to live support, the website has a very informative FAQ section. Unfortunately, MarketsWorld does not offer any additional features or resources. We would have expected and liked to see some kind of learning centre on their website or a social trading or signal feature. However, the website does have a section where they post relevant news and market research. All in all, it’s safe to say MarketsWorld is a reputable and trustworthy binary options service to trade with. The company offers many enticing benefits to their members while keeping things simple and transparent. The level and quality of customer support is outstanding, and traders can achieve many types of bonuses. The platform itself could use some upgrading, and the service does have a lack of assets to choose from as well as additional resources. However, those last few things do not make or break the platform, which means MarketsWorld is a viable option for many traders. Licenced and regulated by a reputable authority out of the United Kingdom. Low minimum initial investment starting from only $10. Very good bonuses for deposits and more. Excellent customer service & support staff. Very low number of financial assets. The platform could use some improvement and Android compatible apps. Traders could benefit from a learning centre, technical analysis, signals, or a resources page. Yes, it’s regulated by the Isle of Man Gambling Supervision Commission. What methods can I use to deposit funds at IQOption? Neteller e-Wallet transfers, Bank Debit cards and Visa and Mastercards, Visa Electron, Visa Debit, Visa Purchase, Mastercard Debit, Maestro, Switch, Solo. Within 1 working day, but may take longer to reach your bank account through external processes. No, unless you make more than one Bank-Wire transfer a month there will be a $53 fee per subsequent transfer. What is the minimum initial deposit requirement at IQOption? The minimum initial deposit is only $10.